The long sandy beach book-ended by two rivers not only gives Scotland’s third largest city its name – ‘Aber’ (meaning between) the River Dee and the River Don – but it is also home to one of the country’s most thriving surf communities. Originally known for fishing, shipbuilding, textiles and paper-making, these days Aberdeen is often referred to as the oil and gas capital of Europe – two industries which have been instrumental to the city’s economic boom over the last 30 years. But those whose affection for Aberdeen extends beyond the economy are more likely to know it as Granite City, because of the famous granite architecture that sparkles in the sun… when it shines. Aberdeen may be more renowned for its oil and gas than its surf scene, but there have been people surfing in the city since the 60’s. 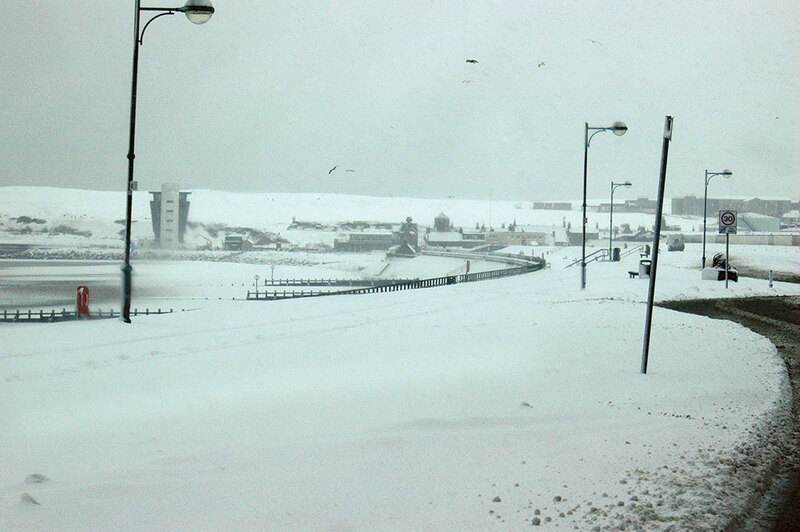 Graham Carnegie is noted as the first surfer to venture out into Aberdeen’s frigid waves. He rode a mahogany framed, plywood and fiberglass board that he made himself, and scored solo sessions from 1964-65. In 1966 Graham was joined by Alexander Mathers, Brian Morgan and Dave Killoh, all surfing homemade wooden boards. One of Britain’s best shapers Tris Cokes and friend Graham Sorensen surfed the south end of Aberdeen beach in the summer of 1968 on a 7’6” single fin in beavertail style wetsuits. And soon others followed suit, including Andy Bennetts, Stuart Crichton and Ian Wishart – some with no wetsuits at all! Surfing really kicked off in the 80’s and 90’s with longboarder Alistair Waite a common fixture in the Aberdeen line-up. Nicknamed ‘The Chief’ thanks to his upright seating position and folded arms whilst waiting for waves, Alistair was joined by other long term locals including Graham Bagnall. These partners in crime explored pretty much the whole of the Scottish coastline – leaving few spots undiscovered. 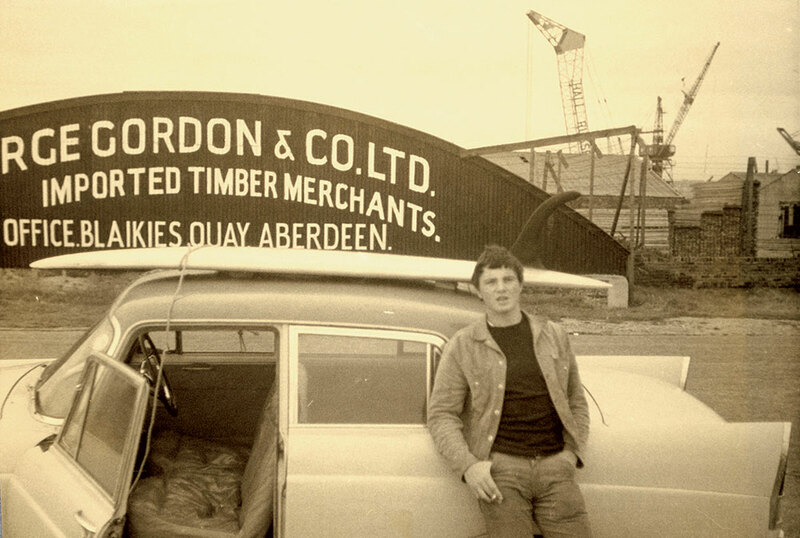 Local surfer Gordon Forbes opened Granite Reef, the first surf shop in Aberdeen, in 1993. The shop quickly became a meeting place for the local surfers, and almost 20 years on it is still going strong – it has in fact relocated to bigger premises. The shop also runs a surf school and has two instructors: Campbell Scott and Dee Ripoll, who are swelling the numbers of the surfing community and educating them in surf etiquette. Due to the size of the city, there is a large number of surfers in Aberdeen, however many only appear during the summer when the sun is out and the wind has gone, so it is unusual to find a crowd in the winter months. Aberdeen has two Universities so there is a large student contingent, especially on Wednesday afternoons when the Uni surf club minibuses transport them to the beach. Inevitably, there are also a lot of surfers temporarily based in Aberdeen working within the gas and oil industries. And surfers en route to Thurso, a four hour drive away, often stop by for a quick splash. But the line-up is mostly made up of the familiar faces of the local crew. Some of them are long serving wave warriors, who have been surfing Aberdeen and the remainder of the Scottish coast for the last 20 years and more. These are the guys who will usually be on it if it is good (as well as at any time when there is anything resembling a wave), and can read a proper synoptic pressure chart! They include Paul Dickson, Richard Knight, Lindsay Hall, Jamie Reekie and Graham Bagnall. There are countless other surfers of varying standards (which are generally on the up), and there is an ever expanding number of girls joining me in the line-up now on a daily basis which is always good to see – when I first moved up there was only a handful of us in Scotland, including Gill Noble (Fraserburgh) and Shoana Blackadder (Thurso). 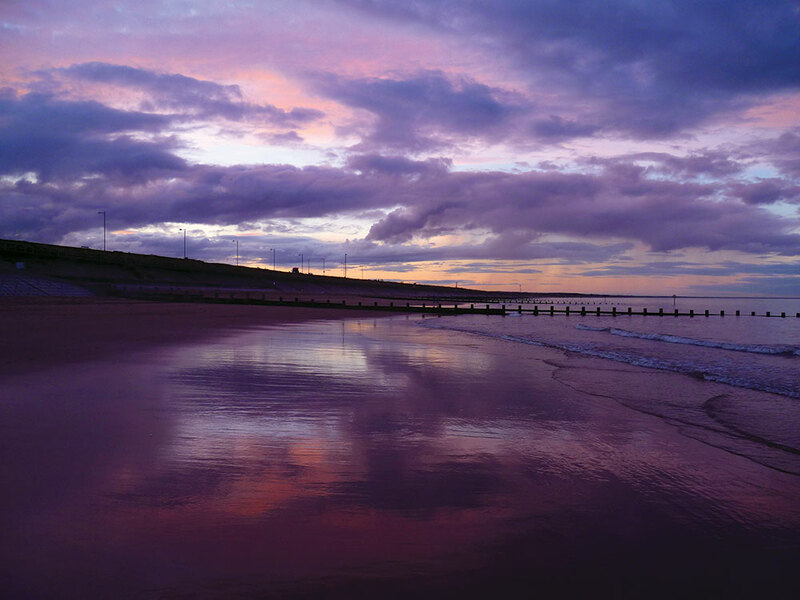 Aberdeen has a long sandy stretch of beach interspersed by wooden groynes which run its length. Being on the north-easterly section of the North Sea coast, Aberdeen has a moderate swell window which can pick up northerly, easterly and southerly swells. The best conditions are when the wind is light and westerly in direction as it cleans up the conditions nicely. On the flip side, if the wind is from the north east and has any strength to it at all, the whole of the Aberdeenshire coast can be pretty much unsurfable. There are two distinct areas which are split by the relatively new addition of rock-pile groynes installed by the council a few years ago (effectively wrecking this stretch of beach and creating new, sometimes severe rips along the rest of the beach). The southern end is referred to as Footdee (literally shortened from ‘Foot of the river Dee’) and known locally as Fittie. The northern end is referred to as the ‘Don’ end, because of the River Don, which acts as the beach boundary. 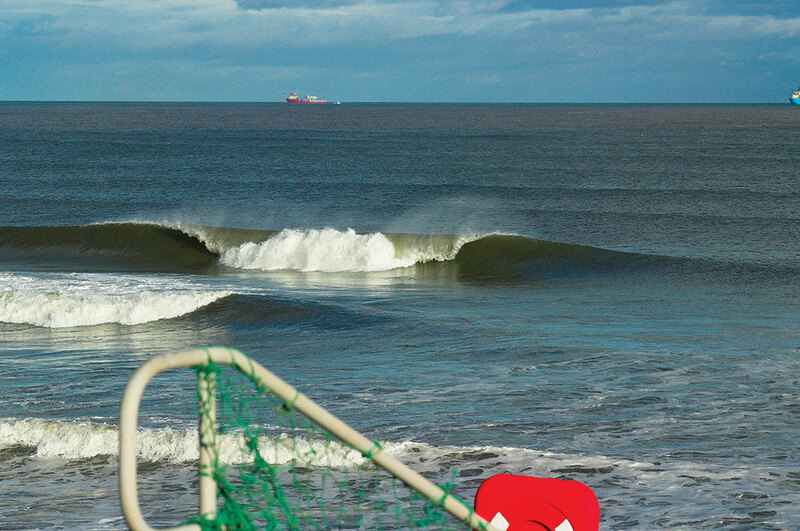 Fittie is best known for its reef by the harbour wall, which can be more of a longboard wave, but lights up on a big south swell. This end of the beach generally works best at lower tides, as at high tide the wall at the edge of the beach can create backwash which makes it pretty much unsurfable. The sandbars along the remainder of this section of beach can be good on certain swells. Don end is a higher tide break, where the sandbars created and held by the groynes can provide good A-frame peaks keeping both regular and goofy surfers happy. The high sea wall provides protection from both W and NW winds. 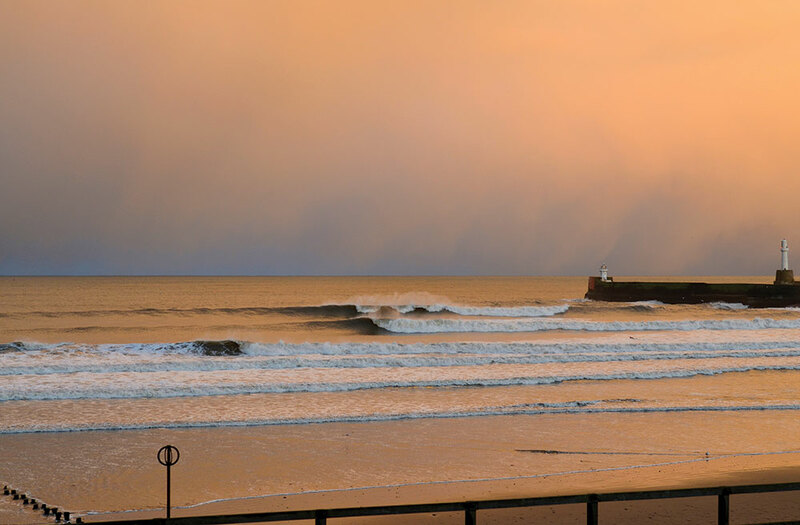 Aberdeen beach can sometimes lack a little of the punch and power of beaches further north due to its long shallow approach, however on its day it can produce some great waves, especially from the short-lived easterly swells. Although the groynes along the length of the beach help to build good sandbars, they can prove hazardous on certain swells, particularly towards the northern/Don end of the beach. On days where there is either a northerly or southerly swell accompanied by wind from the same direction, the Don end turns into a watery conveyor belt. Care must be taken to keep distance from the groynes. There have been numerous near drowning incidents when surfers have been swept over the groynes and their leash has got caught. Since the introduction of the rock pile groynes in the centre of the beach, the southern end “Fittie” has also been more prone to rips – both parallel to the beach and, more worrying, out to sea! On bigger days there is a rip which runs out next to the harbor wall, which although very handy for facilitating an easier paddle out back, unsuspecting and inexperienced surfers can get caught out and drift out to sea and the shipping lanes, so beware! There are plenty of other spots including a couple of reefs in and around Aberdeen within a short drive of the main beach. Heading to the north there are countless other spots to explore with miles of unspoilt beaches and coastline, right the way up to the famous Thurso East. It’s certainly worth getting in the car and exploring up the coast, but when it’s on at Aberdeen, there’s no place I’d rather surf!